When the Ultimate Fighting Championship made Ronda Rousey (pictured) their first-ever female fighter in November 2012, UFC co-owner Lorenzo Fertitta claimed she would be a millionaire. Hard to believe considering most mixed martial artists constantly complain about getting paid peanuts. However, Fertitta wasn’t joking. 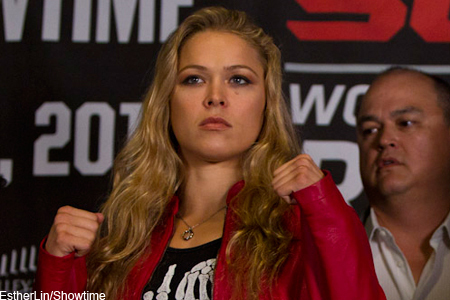 In fact, Rousey’s bank account ballooned much earlier than anticipated. According to UFC president Dana White, after defending her bantamweight belt later this month against Sara McMann at UFC 170, Rousey will likely crack into the company’s top 10 in career earnings in just her third fight. In her big league debut, Rousey pocketed a disclosed paycheck of $90,000, with half of her take coming via win bonus, for submitting Liz Carmouche in the main event at UFC 157. Rousey scored a disclosed $100,000, with half by way of win bonus, for tapping out Miesha Tate in the co-featured bout at UFC 168. She also earned an additional $150,000 in ‘Fight Night’ bonuses that evening. However, those numbers account for just a fraction of Rousey’s total paydays from the UFC. The company is notorious for awarding its stellar performers with top secret discretionary bonuses for going above and beyond the call of duty – not just for the destruction they cause inside the Octagon, but the pre-fight promotional work to pump the pay-per-view card outside of. Speaking of PPVs, Rousey is one of the UFC’s few athletes who gets a cut of the PPV pie for each show she performs in. Not only was her debut one of the most covered mainstream events the UFC has ever produced, she had the privilege of fighting Tate the bout before the most anticipated rematch in MMA history when Anderson Silva attempted to reclaim his throne against Chris Weidman. Of course, when it comes to fighter salary, the UFC keeps as much of that information under lock and key as possible. So there’s no way of knowing how much Rousey is walking away with on the back end. Regardless, it’s undeniable Rousey is a cash cow for the UFC. The only problem is, they better milk “Rowdy” for all she’s worth before she permanently bolts for Hollywood.